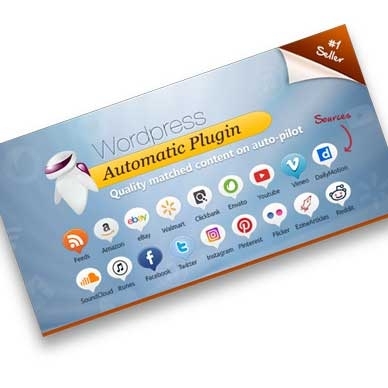 Wordpress Automatic Plugin автоматически парсит статьи на Ваш сайт. It can post quality targeted articles, Amazon Products, Clickbank Products, Walmart products, Youtube Videos, Vimeo videos , DailyMotion videos, Feeds posts, eBay auctions, Flicker images, Instagram Images, Pinterest pins,Reddits ,Twitter tweets, Facebook posts, Craigslist classifieds, Itunes apps/songs/ebooks/movies/podcasts, Envato items and SoundCloud songs on auto-pilot. Он забирает новости с таких сайтов как: Amazon, Clickbank, Walmart, Youtube, Vimeo, DailyMotion, eBay, Flicker, Instagram, Pinterest, Reddit,Twitter, Facebook, Craigslist, Itunes, Envato и SoundCloud.